This boring BADGER robot is anything but, well, boring. The acronym apparently stands for roBot for Autonomous unDerGround trenchless opERations, mapping, and navigation, and in spite of the mammalian nature of the image presented, the project aims to built a large, worm-inspired, autonomous underground tunneling robot, which uses ultrasound and a large drilling head to break apart whatever material is put in front of it. BADGER packs in a ton of smart tech to make it the ultimate drilling machine. It is divided into segments for flexibility and, when necessary, each of these segments is able to clamp against the wall of the tunnel it is drilling; much as a worm moves along by contracting and relaxing its body to grip. 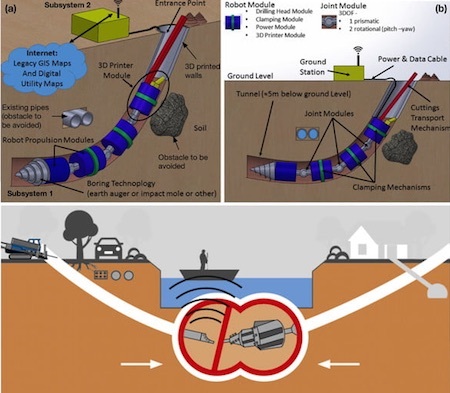 It will also feature a 3D printer that deposits layers of resin as it moves, thereby turning tunnels into pipes, along with an appendage for pumping dislodged soil up to the surface. 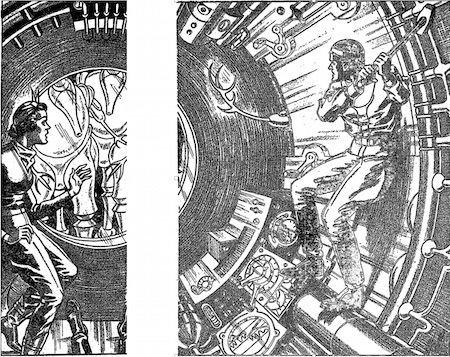 Compare this device to the great metal earthworm from Death Dives Deep (1936), by Paul Ernst. "The real end of the cylinder, Ria," Street explained, "is something invisible. It is a tremendously powerful rotating magnetic field. And it is the secret of the cylinder. That field, acting on substance before it, disrupts its atoms and then whirls the components to the rim of the field. There, the atoms are compacted and condensed. A cubic foot of rock, for example, is compacted to a cubic inch, but retains all its original weight, of course, in spite of its shrinkage. Look." He switched on a light, which lit the space under the glass trapdoor. Ria saw a whirling, furious mist, and, nearer to the glass, a sleek black wall, like black glass. "The compacted matter, whirled to the rim of the hole the atom compacter is forcing for itself, is denser than any substance yet known and more than diamond hard. It makes a better tunnel lining than concrete, don't you think?" I hope you noticed that it also has a compaction feature!